Michael Nelson is an associate professor of environmental ethics and philosophy at Michigan State University. He’s an author of a new report on people’s attitudes about wolves in Michigan. So, your report is based on a statewide telephone survey. What’d you find out? MN: Well, we found out a number of things. We asked a few questions of people. Generally, we found out that people enjoy knowing there are wolves in Michigan. This varies from place to place. We also found out that in general, the people of Michigan really support wildlife biology, wildlife science as an important way to make decisions about wolves. 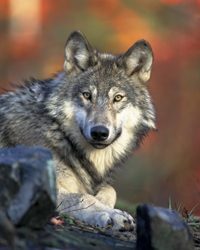 RW: How do people’s feelings about wolves change based on where they live in the state? MN: Yeah, you know, I think we all realize that Michigan, like many other states, has different kinds of cultures within the state. And of course, we also know that people who live in wolf territories have different ideas than people who don’t, and people who live in rural areas have different ideas than people who live in urban areas. Generally, we found that there was less support for wolves in the U.P. as opposed to the Lower Peninsula. Overall, 82% of Michiganders enjoy knowing wolves exist in Michigan – that’s how we phrased that question. In the northern lower peninsula where there are wolves now, it was 82%, they were average as well. In the U.P. it was 61% of people who enjoyed knowing wolves existed in Michigan. RW: And far and away, most of the wolves in the state are in the U.P. RW: So, Michigan’s wolf management plan does not call for a hunting season for wolves. The state legislature would have to decide that. In your survey, you asked people, “Should there be a wolf hunting season in Michigan?” What’d you find out? MN: Well, we found out that 85% of Michiganders disagree with that, and it varies, again, a little bit from place to place in the state. And that 14% of Michiganders agreed that they would be likely to purchase a license to hunt or trap wolves. Of course, we’re only reporting their behavioral intention. Their actual behavior would be something else. RW: Last July, reporter Bob Allen produced a story about illegal wolf kills spiking in the Upper Peninsula. He reported that wildlife officials said they could defuse the situation if they could just get gray wolves removed from the endangered species list. In the piece, we hear from the manager of the Hiawatha Sportsmen’s Club, Larry Livermore. He says in the U.P. – people are increasingly convinced wolves are decimating the deer population. Your most recent survey was done in 2010, well before the wolves were taken off the endangered species list. How do you think people’s opinions might shift now that the wolves are off of the list? MN: Oh, that’ll be the next great survey question. There’s really something important to discover. It was kind of fortuitous that we gave our survey just before the wolves came out, just before they made it to the lower peninsula. So a survey in a year or two could really reveal some interesting things. Michael Nelson is a professor of environmental ethics at Michigan State University. Thanks so much for talking with me.